Alongside star athletes, royals and vice presidents, an unpronounceable village in Wales had its moment in the search spotlight this week. Read on for seven days of search trends. Stephen Colbert took to the air as the new host of CBS’ The Late Show Tuesday, with an impressive 6.6 million viewers and half a million Google searches for the premiere, and a search spike every night since. The week’s star-studded line-up included actors George Clooney and Scarlett Johanssen, but by Friday morning it was guest Vice President Joe Biden who was driving the search buzz for the frank and emotional conversation he had with Colbert about the family tragedies both have suffered. The interview wasn’t all serious—the VP joked about the host’s 2008 run for the presidency, and proposed joining forces for 2016. A Colbert-Biden ticket would be tough to beat (in searches, at least). Game on. 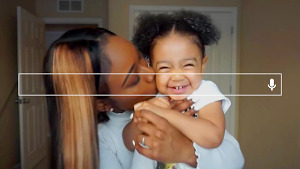 As Venus and Serena Williams faced each other this week in the quarterfinals of the U.S. Open, the sisters generated a combined one+ million searches from people following the action online. 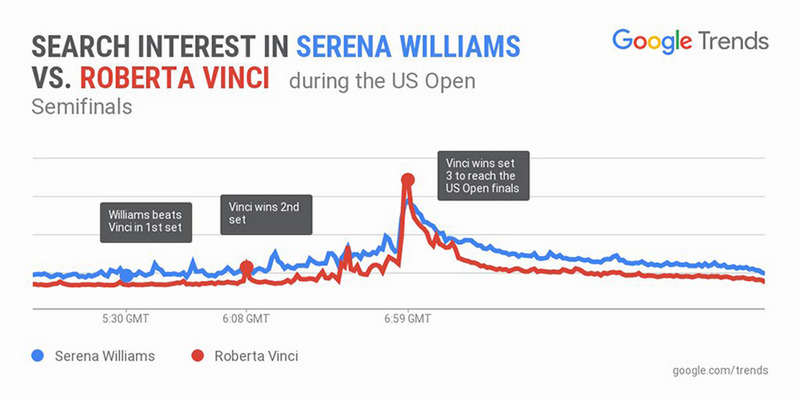 Serena ultimately beat out older sister Venus both on the court and on Google—topping Venus Tuesday in search volume. Heading into the weekend, all eyes continued to be on Serena and her bid for the first tennis Grand Slam win since Steffi Graf’s in 1988. But it wasn’t to be. As Serena suffered a shocking semifinal upset by Roberta Vinci of Italy this afternoon, people from Jamaica to Romania to Zimbabwe followed the action on Google. This week, Queen Elizabeth II became Britain’s longest-reigning monarch, surpassing the record set by great-great-grandmum Queen Victoria. (According to the BBC, this happened at 23,226 days, 16 hours and approximately 30 minutes … but who’s counting?) This milestone was popular across the pond—the U.S. was the top country outside the Commonwealth searching for information about Her Royal Highness. But her loyal subjects in the U.K. also had questions. Besides some basics like the Queen’s age and her cash flow, one question Brits repeatedly searched on Google this week was: Why does the Queen celebrate two birthdays? The lengthy official answer on the royal website references the weather, King Edward VII, and horses. An alternative answer? Because she can. 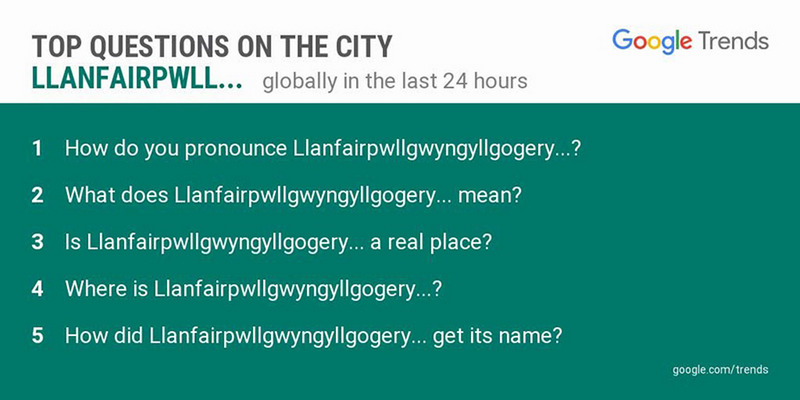 At 58 letters, the Welsh village of Llanfairpwllgwyngyllgogerychwyrndrobwllllantysiliogogogoch has the longest and most notoriously difficult-to-say place name in the United Kingdom. And after Welsh weatherman Liam Dutton nailed its pronunciation live on air Wednesday (and subsequently on YouTube), people around the world turned to Google with a collective “Whoa!” Along with wanting to know if this is a real place (yes, indeed), and how it got its name (unconfirmed, but one YouTube commenter suggests it was named by a cat taking a walk on a keyboard), the top search on Google was, of course, how to pronounce it. With 7 million views and counting, here’s weatherman Dutton with the answer. Show-off. Abbi Tatton searched this week for "the war of 1812."